Happy Halloween, everyone! It is the spookiest day of the year and I hope yours is filled with huge amounts of fun and, most importantly, sweet treats! This is my last Halloween card for the year, so I felt it would be very appropriate to finish the spooky season with a bang. 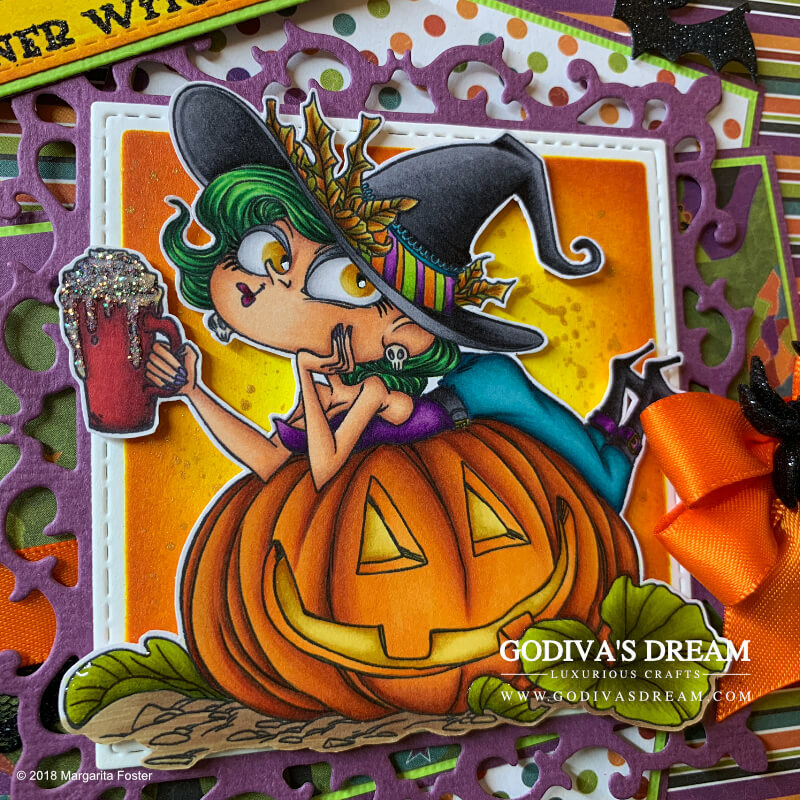 More witches, more pumpkins and even some coffee is definitely in order! What say you? It is not often that I make a decision to use a certain paper collection for a project because of a single pattern in it. That is precisely what happened in this case. 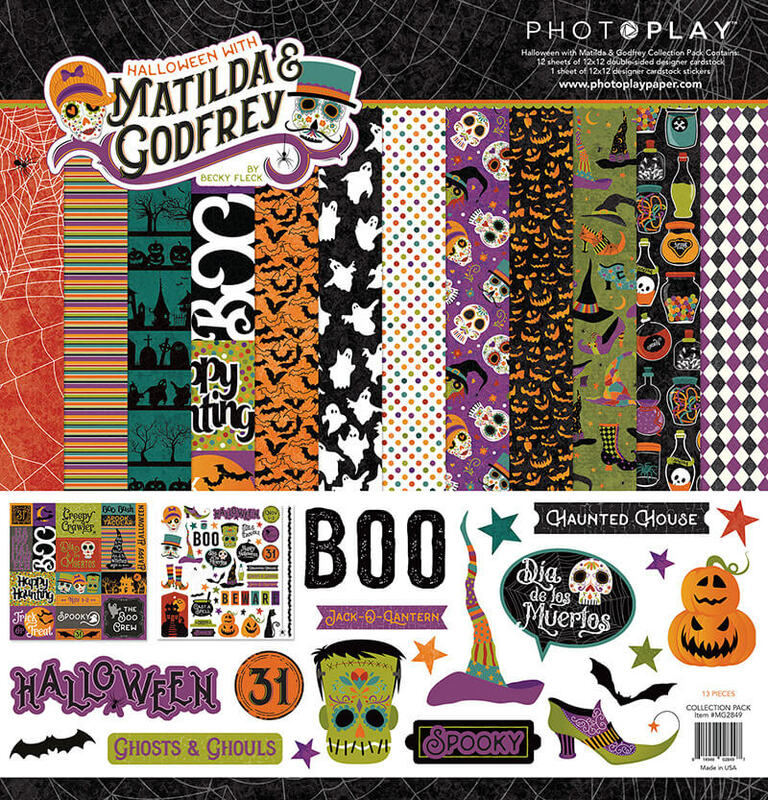 Last year I purchased a super fun paper collection by PhotoPlay called “Halloween with Matilda and Godfrey” and while I was gathering the materials for today’s card, I remembered it had beautiful green paper with fancy witch hats and boots. Ironically, as you will see in the photos later, most of that pattern got covered up by other card elements. Once I settled on the layout I wanted to use, I cut the papers to sizes needed and matted them on American Crafts cardstock in purple and lime green. I normally avoid double matting, as my cards tend to have quite a few layers and doing that can easily make everything look and feel very bulky. On this occasion, however, I really liked the effect the combination of these two colours and patterns created, so I went for it. No regrets! This year I’ve already created a few Halloween cards with a strong green and purple colour scheme, so I decided not to repeat myself, but to bring in some warmer colours for contrast into this project. Orange and even yellow always looks great for Halloween. My chosen patterned papers only had small accents of orange here and there, so I picked a bold orange ribbon to really bring out the warmer tones. I also added some black lace for an elegant touch. I had this “Pumpkin Spice Witch” stamp by Annie Rodrigue since the day of the release and I really really couldn’t wait to colour it! It looked like it would be a lot of fun to do and I definitely wasn’t wrong! I coloured the image using Promarker, Brushmarker and Copic alcohol based markers in shades that complemented the papers and overall feel of the project. Once I finished colouring, I fussy cut the stamp out, leaving a very narrow white outline around it to make the image pop against the background better. I also added some Stickles glitter glue in “Diamond” to the witch’s drink to make it look more magical and covered the pumpkin leaves in “Glossy Accents” by Ranger to give them the shine and glossiness. The patterns of the papers I’ve picked are quite busy, therefore, to avoid clashing, I decided to create quite a simple background to show off the stamp. I cut out a stitched edge square using a die and blended Distress Inks in “Squeezed Lemonade”, “Mustard Seed”, “Spiced Marmalade” and “Rusty Hinge”. I started with the lightest colour (Squeezed Lemonade) in the centre and kept adding darker shades as I was moving outwards. I couldn’t resist sprinkling some diluted gold acrylic paint over the inked area. This gives extra interest to the background and adds very subtle golden shimmer. The layout of this card involves tilted layers which creates sharp angles, I wanted to keep that look, so I chose a square frame to showcase the stamp. I love Spellbinders Nestabilities Fleur de Lis Square (S4-318) die set, it’s quite ornate without being too overwhelming with detailing, which is perfect for this project. I cut out the frame from the same purple American Crafts cardstock I used to matt the patterned papers. I then glued the inked background square I prepared earlier to the frame and adhered the coloured stamp in the middle, using 3D foam pads to give it some dimension. The whole focal piece was attached to the card using dimensional foam as well. I had already added a length of the orange satin ribbon when I was layering the papers, so creating a double-looped bow was a no brainer. I love embellishing with ribbon and bows, not only do they add to the variety of texture on the project, they also look quite luxurious. To give it a spooky feel, I adhered a glitter spider button by Dress It Up in the centre. I wanted to keep the patterned papers as visible as possible, so instead of using flowers as I often do, I opted for a quirky sentiment (Kraftin’ Kimmie Stamps “Witch Wanda” stamp set). I stamped it in Versamark and heat embossed it, using Nuvo embossing powder in “Glitter Noir”. I then die cut the sentiment using a stitched edge flag die, and inked it the same way I did with my background. I matted the inked and embossed sentiment on purple and lime American Crafts cardstock and then adhered it to the card using 3D foam. I’m a fan of busy cards, which have a lot of different elements and embellishments to draw one’s attention to, so I added a couple of black shimmery bats (La-La Land Crafts “Eerie Bats” die) and finished the card off with purple glitter enamel dots. Have you managed to create all the Halloween projects you wanted to? What is next on your crafting list? Leave me a comment and thank you for reading, until next time!